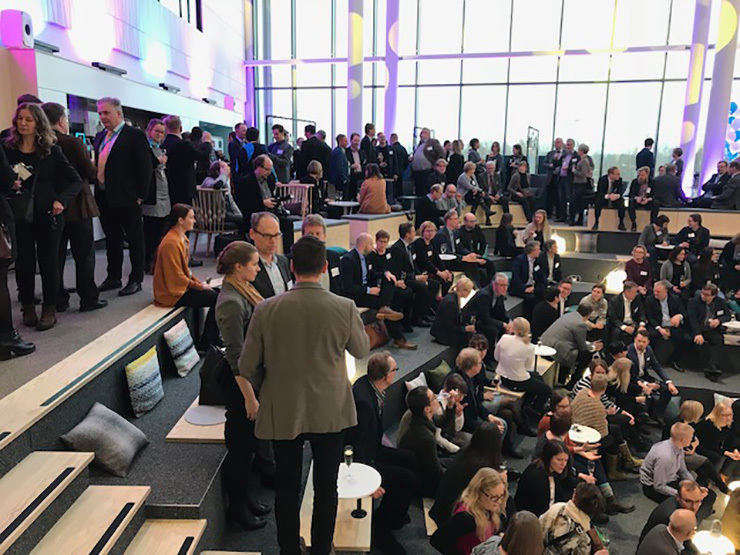 Helsinki Region Environmental Services Authority HSY’s office opening party took place 17 February 2018 in a new office complex built next to the water towers of the Ilmala district. It was a full house of guests, and the atmosphere was amazing. Entertainment included music by Niina Tapio and her orchestra and high quality drinking water from the tap served in fun recycled bottles. 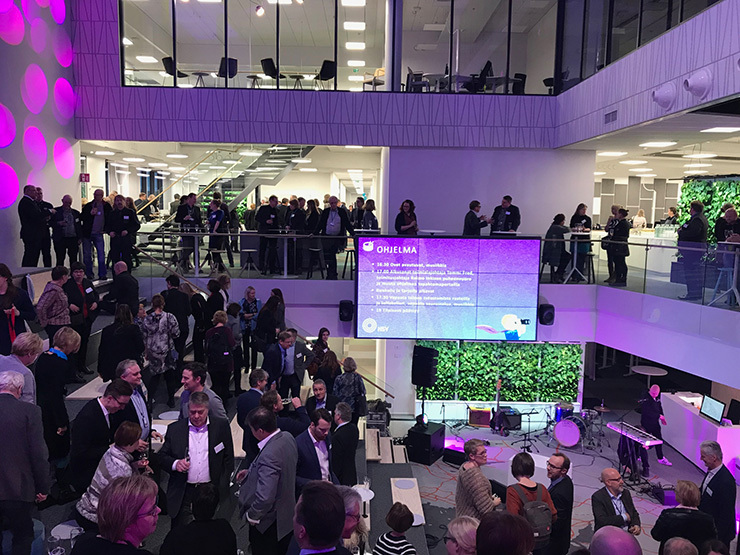 Gullstén-Inkinen took part in this project managed by construction company Hartela since the get-go. In the beginning, we assisted the contractor and the architect to develop a unique layout, first for the whole building and then for HSY’s premises. The personnel sits on two floors only while the meeting rooms are located in the basement. GI’s strong expertise in creating a spatial plan showed once again how it can add value to a property. The right kind of spatial solution was key for HSY when deciding the location of its offices. The new offices provide working space for 310 persons. People from three different locations moved into the new address. As part of the design, we created a HSY “market square” that can host various stakeholder events. During the opening, the market square was very much in use and found to include great acoustics. 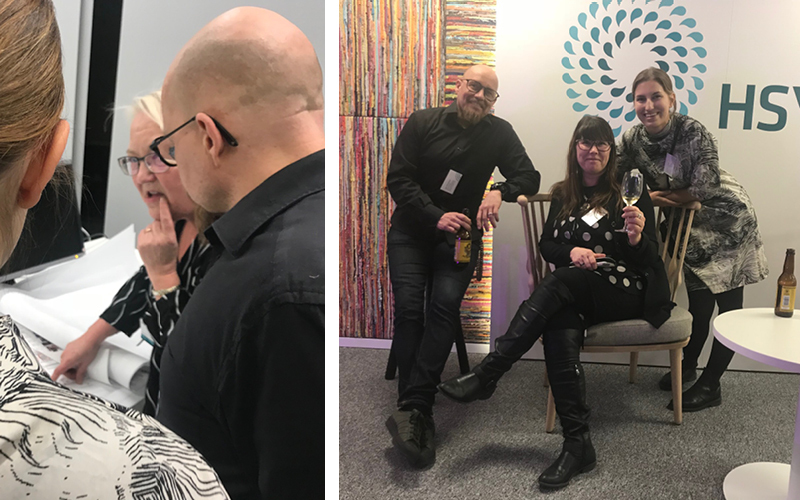 In order for the HSY organization to be able to use the premises in the best possible way, the work environment specialists in our design team helped them with change coaching, for example. GI also designed the interiors of the HSY premises, one of the themes being a collection of maps of the metropolitan area. Recycling is an important part of the HSY operations, and therefore it is visually present in the premises. GI also designed the Hartela and Cinia premises in the same building as well as the entrance and the restaurant and cafe section by the entrance. Many thanks to all who participated in this project for great cooperation and to our clients for letting us participate. 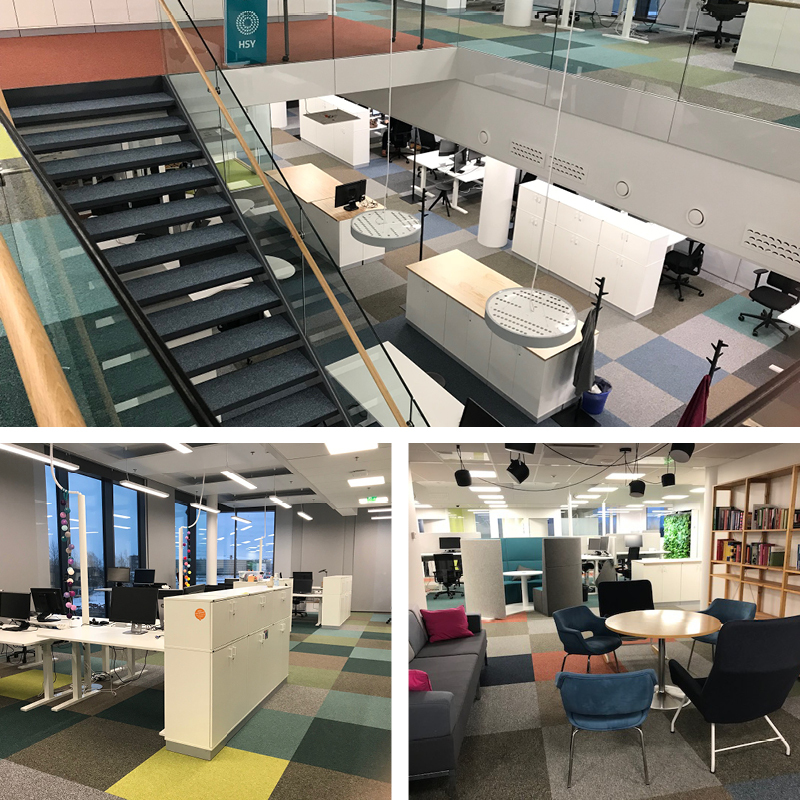 You can visit the property at Ilmalantori 1 to see which way the customer areas of the new generation offices are developing. The interiors use many of the HSY furniture from their previous offices, including shelves and chairs. 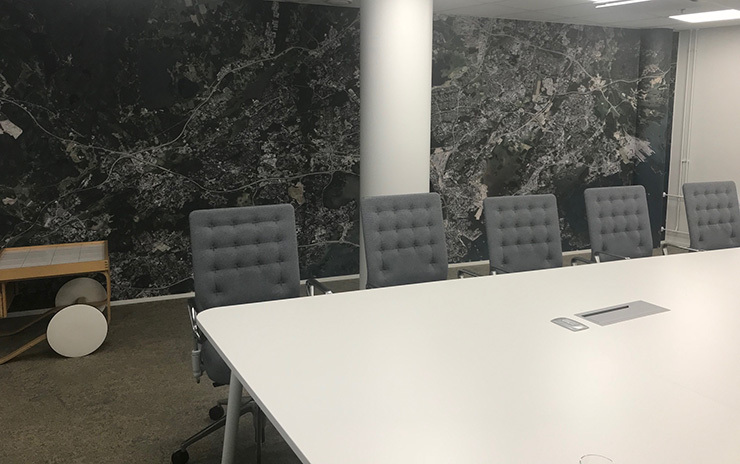 The walls of the meeting rooms feature photographs of various milieus in the metropolitan area. One huge aerial picture has captured people’s hearts: every visitor wants to spot their house in the picture. HSY’s project manager Tuija Räty (left) played a major role in the success of the project. She was relentless in leading the HSY people through the process of moving from traditional offices to a multi-purpose environment. On the right, GI design team members in party mood.